Today 24th of February 2014 we have started our 'Project week'. This year it is dedicated to our project. Every level studies in depth one of the partner countries. One of the 'traditional' activities for this week are the 'inter-age workshops'. 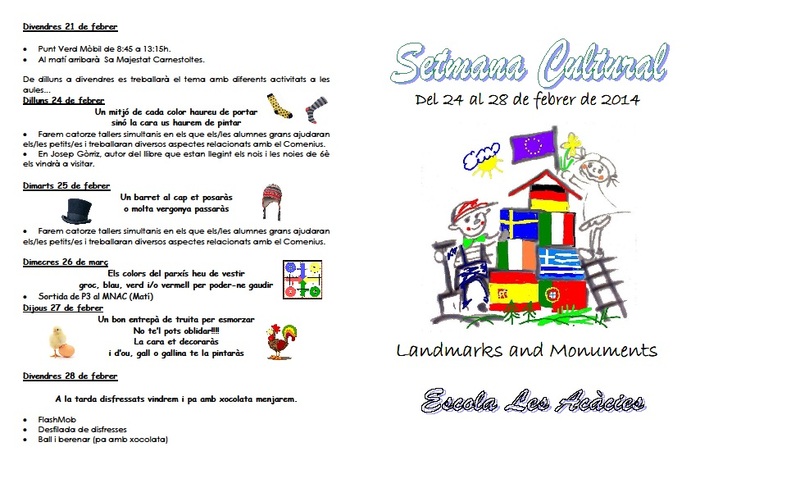 Every teacher runs a workshop in which we do an 'arts and crafts' activity focusing in our Landmarks and Monuments and the different partner countries. We just started this morning! Here you have the brochure of the 'week'. Children in class 6 have investigated closely the different partner schools and towns and have created this collection of leaflets with information. The children in class 5 have been investigating about the countries in our partner schools. They have created poster displays and made oral presentations to their classmates. All in English! !